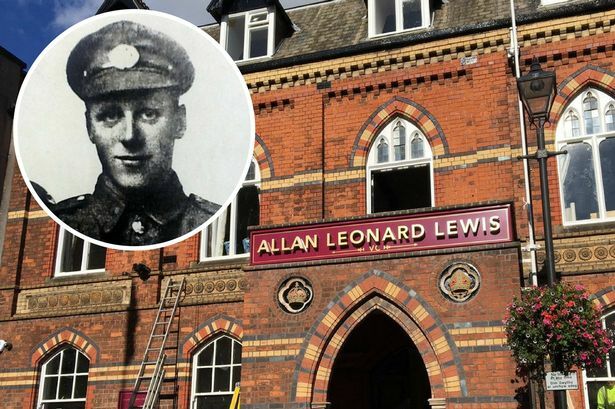 Three days earlier at Rossnoy, near Lempire Lance-Corporal Allan Leonard Lewis (Northamptonshire Regiment) is in command of a section on the right of an attacking line, held up by intense machine-gun fire. He sees that two guns are enfilading the line and crawls forward alone, successfully bombs the guns and by rifle fire makes the whole team surrender. Today he rushes his company through the enemy barrage, but is killed while getting his men under cover from heavy machine-gun fire. For his efforts on both days he will be awarded a posthumous Victoria Cross. He is killed at age 23. Captain Edward Walter Bethell (West Surrey Regiment) is killed in action at age 26. His younger brother has been killed in the Battle of Jutland and they are sons of Admiral ‘the Honorable’ ‘Sir’ Alexander E Bethell. Captain Arthur Edward Adderley Buller (Norfolk Regiment) is killed in action at age 35 in Palestine. He is the son of the late Reverend R W Buller and has a brother who will be killed in August 1918. Captain John Tristram Yarde MC (Bedfordshire Regiment) dies of wounds at age 24. He was the Head of Bedford School and Captain of Boats and rowed for Christ College, Cambridge. Captain Charles Eric Hatfield MC (East and West Kent Yeomanry) is killed at age 31. He is the son of first lady Mayor of Margate. Second Lieutenant Harold Viggars Bright (Sherwood Foresters) is killed. His brother was killed in June 1917. Second Lieutenant John Savage Larken (East Kent Regiment) is killed at age 33. His brother was killed in November 1916. Private A Carmichael (Cameron Highlanders) is killed. His brother was killed in November 1916. Private George Henry Frazer (Royal West Kent Regiment) is killed at age 31. His younger brother was killed in August 1917. Private John James John (Welsh Regiment) dies of wounds at age 25. His brother was killed in August 1918. Private George Neville Hearson (Devonshire Regiment) dies at home at age 24. His brother was killed in March of this year.